A rich and creamy hot chocolate mix – easy to make and sure to please. 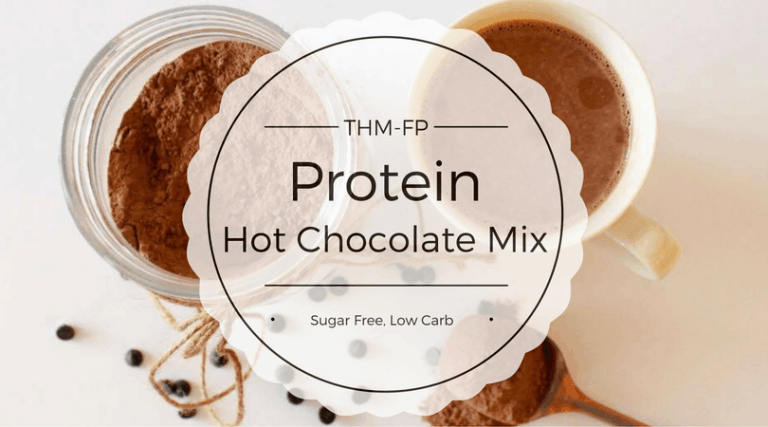 This hot chocolate mix also has protein powder and collagen, so you get a nice protein boost with your hot cocoa. What could be better than that? My kids love hot chocolate. In the days before I took them off sugar, they would drink hot chocolate every morning. They were addicted to it just as much as I am to my morning cup of coffee (wait, I’m NOT addicted)! Every morning, it was hot chocolate, cooled down with milk and (gasp!) creamer. Sugar, and more sugar! Yikes! 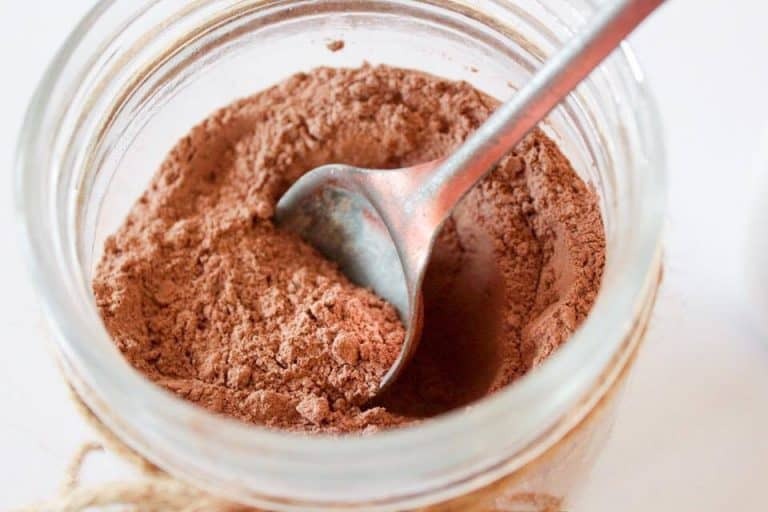 For some time now, I’ve wanted to make a powdered hot chocolate mix that is THM-friendly. The first time I tried, it was OK, but not great. I made some tweaks, whirled it in my blender again, and thought it was going to be perfect! Until I tasted it and realized I had forgot to put the sweetener in it! Blech!! Finally, after much trial and error (and taste testing from my kids), I hit upon success. I let my 9 year old son try it first – “Mmmm . . . it tastes like real hot chocolate!” Score! I added protein powder and collagen to the mix for two reasons. It helps to mellow the flavor of the cocoa and make it creamy. It gives you an extra bump of protein – over 5 grams per cup if you use unsweetened almond milk. I really am a drive-through-Sue at heart, and being prepared ahead of time is a game changer for me. 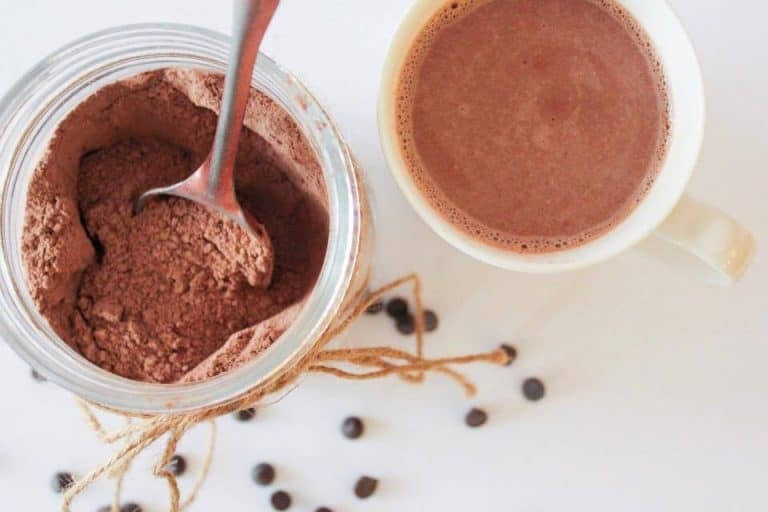 With this hot chocolate powder, I can have a cup of hot chocolate whenever I want! Oh, and did I mention that it is FP? You’re Welcome! If you would like to try a hot chocolate recipe that is a little more involved (and has okra! ), check out my Secret Ingredient Hot Chocolate Recipe. Add all ingredients in your blender, and blend for 10 seconds or so until all ingredients are well combined and the chocolate chips (if using) are broken into small pieces. Heat 8-10 ounces of Unsweetened Vanilla (or Plain) Almond Milk or Cashew Milk. Add 2 Tablespoons of Hot Chocolate Mix and stir until dissolved. Any substitute for sunflower lecithin? If I do decide to buy it, what form – powder or liquid? What are the benefits of it? You do not have to use the lecithin, but it acts as an emulsifier to keep all the ingredients blended together. It is also very good for your brain! I use the powdered kind. Excited to make this. Anyone else put Hot chocolate in their coffee? So good! Yes, that is how I made myself start liking coffee over 15 years ago! ? I do hot cocoa in my coffee. Sopoo yum! People look at me crazy, but every day I’m excited to have it! That said, I actually thought even though I gave up all day soda habit, bread, etc, the cocoa (premade store bought sugar filled junk) coffee thing may be my no go stopper. Had tried several recipes and they weren’t working for me. But….then I tried this recipe. This is the one! I tweaked the slightest bit on amounts of cocoa and sweetener to my specific taste, but the mouth feel, the balance, the indulgent creaminess…oh yes! This is the saver for me! Thank you, thank you! 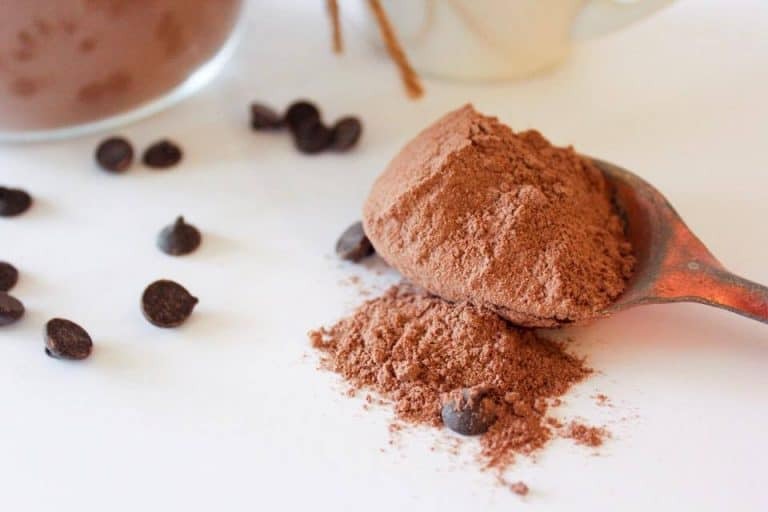 I have been adding collagen powder to my yoghurts – what a great idea to use it in hot chocolate. Will try! This sounds great! I can’t wait to make some to keep on hand. Sounds like you when through quite the process to get that perfect cup! I’m sure your kids are very grateful! I’ve never thought to make my own hot chocolate mix but this sounds much healthier and probably waaaay better tasting this way! Beautiful photos and this hot chocolate mix sound perfect! Hi new to thm. I have plant based organic protein from sams club. Is that ok to use. Could you use 85% chocolate, instead of the Lillys chocolate chips? Such a good idea! Healthy hot chocolate? Yes please! Could you add this to hot water rather than the nut milks? I am taking a group of kids to camp next week and am looking for things that don’t need to be in the fridge. I will have hot water but no almond milk or anything like that. Any other ideas for things that can be kept at room temperature? I have tried mixing it in hot water, and personally, I did not like the result. The almond milk helps to make it creamy. I would try it and see if you like it – a few of my readers did! Ha! I just made this and totally forgot the sweetener even after reading about you making the same mistake! I added it in and now it’s delicious! Thanks! Too funny! So glad you like it! Thank you for coming up with this. I used to make hot chocolate mix but it certainly wasn’t healthyA. Thanks again! Can I use the THM chocolate whey protein instead of plain? Maybe I will make it like written and then replace if I feel like I need it to be more chocolatety. Oh, that is a great idea! I need to try that! So would you use 2 heaping, rounded or level tablespoons of mix? Mine are probably more heaping than level . . . but its totally up to you! Can all collagen be used, don’t have whey….thank you. Yes, you can use all collagen. This hot chocolate mix sounds amazing! Thanks for sharing! I love this recipe, best hot choc one I have tried so far. I make chocolate milk sometimes too or add ice and blend. I am wondering how much protien would be in the 2 tbl spoons? There are about 5 grams of protein in 2 Tablespoons of mix. Love this recipe! I am no fan of almond milk but found with this recipe plus 1/4 cup peanut flour I can’t taste any almond flavor. Thank you for all your recipes! If I use chocolate protein powder do you think I would still need/want to use chocolate chips? Do you think 85% chocolate will work then too, I don’t have Lily’s 😔 I do have Hershey’s Sugar Free Chocolate Chips. THANK YOU for your hard work in testing these recipes! I think you could omit the chocolate chips if you use chocolate protein powder. 85% dark chocolate would work equally well. Thank you so much and thank you for always giving us wonderful recipes!!!! My daughter agrees with your kids. This tastes like real hot chocolate. I’m a happy mama too. Thanks for sharing your recipes.